If you had asked me two months ago what Kombucha is, I probably would have guessed that it was yet another village with an outbreak of bird flu. Not only would I have been wrong but, if some of the health claims are true, Kombucha could very well be an antidote to the dreaded species jumping illness. Kombucha is in fact a fermented tea that originated in East Asia and was introduced into Germany at the turn of the century. Since the early 19th century, Kombucha tea has been promoted as an immunity-boosting drink that can strengthen the body against many ailments. It became more widely used in the United States partly because it can be made at home. A quick Google search of the tea will bring sites that both espouse its health promoting virtues, as well as warn about its possible harmful side effects. The same can be said about Googling almost any substance known to mankind, so, “Caveat Googler”. Kombucha crossed my radar when a coworker said she was making it at home and loved the taste. She had several of the starter discs, known as scoby, for symbiotic colony of bacteria and yeast, more affectionately known as “the mother,” somewhat less affectionately as “the mushroom,” and really less affectionately as “that slimy little disc that sits on top of the tea when it has finished fermenting.” This disc multiplies with each batch so my coworker was creating her own little scoby family and eagerly looking for good homes for her children. Apparently, some people who brew Kombucha develop an attachment to their scoby; giving each its own name and talking to it as if it had consciousness. Therefore, I was pleased to learn that my coworker was not going to make me complete a background check before giving me one. 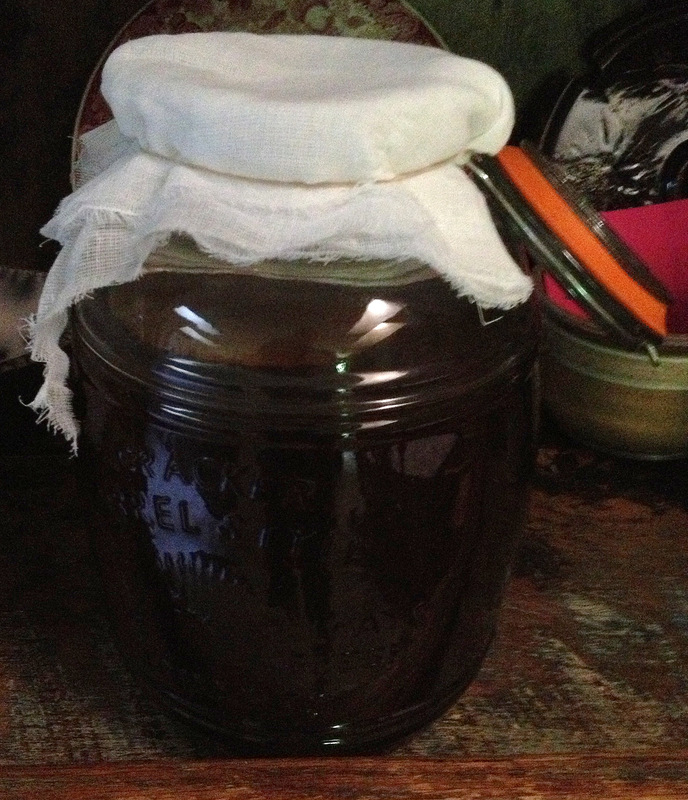 The instructions for making Kombucha are all over the internet, and once you have your scoby the process is very straight forward. Here’s a link that we found helpful http://www.youtube.com/watch?v=8lH-xXDIEtk. Just in case you don’t know anyone who is growing their own scoby civilization, Tess has you covered as she carries them at the Off the Vine Market thanks to Farmstead Ferment. We made our Kombucha with organic black tea and organic sugar. The largest time commitment is in waiting for the brew to come to the right temperature before adding the scoby. 90 degrees was the suggestion we came across, and it seemed to take forever. I felt like the expectant father pacing back and forth, frustrated by the knowledge that there was nothing I could do but wait before taking my little scoby and gently placing it in its new home. . . My God, I’ve become one of them! Now, for more waiting. Reportedly, within the next 10 to 14 days, the magic blend of bacteria and yeasts will do their bactering and yeasting; thereby creating a new scoby and moving the elixir closer to the drinking state. Stay tuned, as I will continue to blog the results as we move through the process. Just in case you’re thinking that reading a blog about someone fermenting tea is as about exciting as watching cheese mold, (hmm, a whole new blog) then you will miss out. Part II is going to tell the story about how my wife, Kathy, is convinced that she had stumbled across this process when she was a teenager, much to the frustration of her mother who was constantly reminding her not to leave her glasses of tea in her room.